If you’re looking for something new to do with the children this weekend – and want something to encourage them outdoors – then why not try a Treasure Trail; an imaginative and fun way to explore. 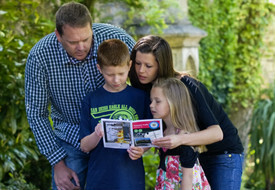 Treasure Trails are self-guided themed walking treasure hunts, ideal for discovering more about where you live or for taking on holiday. And at just £6.99 each, they offer a great value activity that everyone, whatever their age, can enjoy doing together. There are over 30 different Treasure Trials available, covering towns, cities and rural areas across Oxfordshire and Buckinghamshire and over 1,000 across the UK. All Trails are listed on the website so you should easily find somewhere you would like to explore. You can choose between three themes; a Treasure Hunt, a Spy Mission or a Murder Mystery. At the outset of each Trail the “mission” is given – to find the treasure, crack the spy code or discover the “whodunnit”. You then follow an easy route and answer a series of clues involving some interesting, scenic and historical sights along the way to find the answers. Treasure Trails vary in length, but most average two miles and take a couple of hours to complete. Clear symbols on the front of each Trail will tell you at a glance the length of the Trail, how long it should take you and whether it is pushchair and wheelchair friendly. Each Treasure Trail also has a “Trail Trouble Textline” that offers instant help with the clues in case you get stuck – so no Trail should remain unsolved. When you have completed the Trail you can submit your answer online for the chance to win up to £1,000!